Drinks Publications is a division of the Liquor Merchants Association of Australia Ltd [LMAA]. “drinks trade” follows and editorial policy of “business-first” and enjoys a reputation as one of the most widely read information sources for liquor industry professionals. The magazine provides relevant information across customer channels and product categories to ensure all those who work in the industry are kept informed and updated. The magazine is now the highest circulating liquor industry publication [officially audited by the Circulations Audit Bureau]. In addition “drinks guide” is the “industry bible” for anyone working in the trade, supported by a comprehensive website with over 16,000 liquor products across all categories fully searchable. “drinks yearbook” is an exclusive book highlighting all the key developments in the Australian Liquor Industry over a 12 month period. 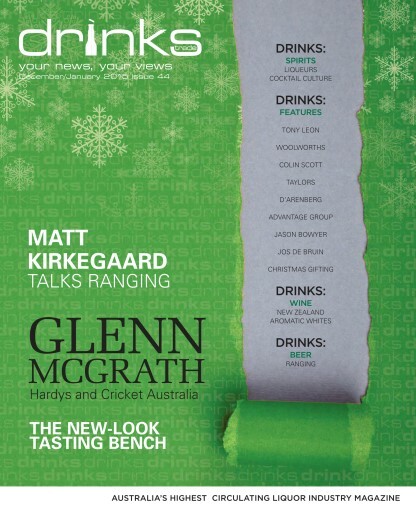 drinks trade December/January edition: The top drinks industry news from Australia and abroad for December and January; top interviews with ALDI, Colin Scott, Glenn McGrath, Jos de Bruin, LSA NSW, Scott Marshall, Tony Leon and Woolworths Liquor Group; features including our pick of the top gifting options for this Christmas; making the most of your range by Matt Kirkegaard; Nigel Weisbaum explains Australia's cocktail culture; Hannah Sparks provides some top tips on how to sell liqueurs this Christmas; Ben Canaider writes about the latest trends in New Zealand wine - is sauvignon blanc here to stay or on its way out? Ken Gargett and Ray Jordan each bring you their top 20 reviews of aromatic whites; LBW & Partners reveal their secrets on how to finance this Christmas, while Advantage Group reveals the findings from their latest drinks trade survey, and of course we bring the next two wineries in our Australia's First Families of Wine series. You'll receive 6 issues during a 1 year Drinks Trade magazine subscription. You'll receive 6 issues during a 1 year Drinks Trade magazine print subscription.